Planning out a kitchen remodel can be tricky. There are so many options today from cabinet styles and colors to tile, flooring, lighting and hardware. When looking for inspiration online, it can quickly become overwhelming when you find so many different things that you love so finding a way to narrow down the options to things that you’ll love and will work for your home and style takes some time and thought. I’m one of those people that likes a lot of different things and I can find it hard to make a final decision when I know it’s something that I can’t easily change down the road. This is part of the reason why B and I never jumped into the kitchen renovation before now. In recent years, B and I have kept to a modern farmhouse feel that has a coastal touch. We used shiplap above our fireplace and an old barn beam as a mantle before we ever knew Joanna Gaines existed. We’ve just leaned toward that style because it feels both modern and warm with color and texture without feeling like you are drowning in anything too heavy for delicate. We’ve also found this style fits our more casual lifestyle and holds up well with dogs that aren’t always easy on our home and belongings. The coastal touch comes in from our love of the beach, boating and water. Natural elements mixed with soft and airy blues and greens creates a bright but calm place to relax after a long day at work and reminds of of trips to come and memories we’ve made along the way. When it came to the kitchen, I’ve change my mind several times about cabinet color. I started there thinking I’d then build the design based on the cabinets. From the time we bought this house, I was sure I wanted white cabinets but then grey became popular and I loved that it was still light but maybe wouldn’t show dirt quite as much. Then I became obsessed with black but was torn on that making our small, galley kitchen too dark and cave like. We explored options of doing 2-toned cabinets but that never quite felt right and then I ordered a sample from Cliq Studios and fell in love with their Harbor color. We ordered a sample and it’s the perfect combination of blue, green and gray and just enough color without feeling too bold or dark. In the end, cost became a factor. After talking with the kitchen designers at Lowes, Home Depot and looking online at other direct buy locations, we found RTA Cabinet Store through a contractor my husband knows. After comparing cabinet construction, upgrades and styles, RTA came with many of the features that require upgrades elsewhere at drastically less cost. The downside turned out to be fewer color options. While using quality cabinets is important, paying almost double for the same cabinet construction just to get the color wasn’t worth it when I knew I could make the kitchen look just as amazing by just doing with white cabinets. We ended up using RTA and went with their Traditional White Shaker Style. And with that decision made, it was time to begin putting everything together. 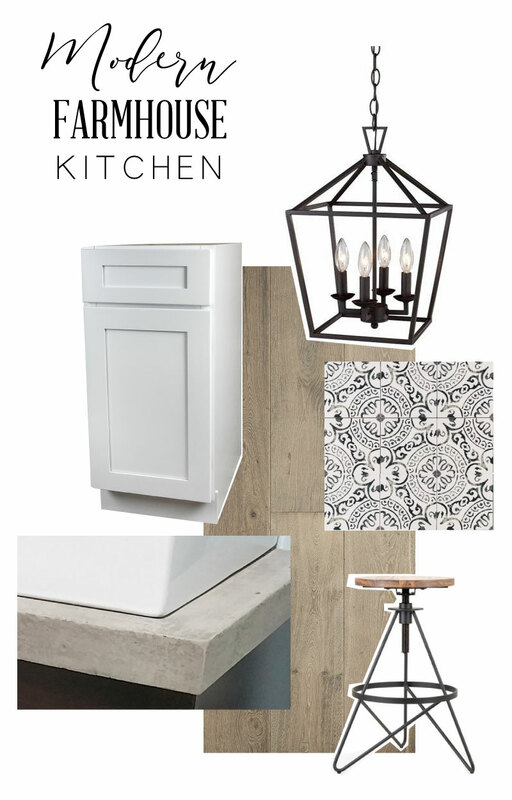 Our simple, modern, farmhouse kitchen will be primarily black and white. To keep it from feeling too color and stark, we’ll be keeping those pretty oak floors we put in last year and I want to find bar stools for the back side of the island that feature both wood and metal for a modern, industrial vibe. When things start coming together more clearly, I plan to add some kind of rug runner to the floor between the wall of cabinets and the island for comfort and some color. I’m also thinking of painting the walls a pale blue-green color and accenting in soft blue-green to add in that touch of coastal flair that we love.